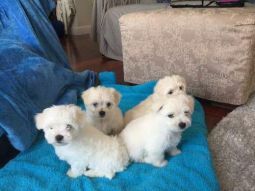 Maltese breeders links and breed information on pups4sale.com.au. pups4sale testimonial: ...you make selling puppies on your site a pleasure. nothing is ever to much trouble to you. thanks again. A jovial companion for over 25 centuries, the lovely Maltese is renowned not only for its impeccable good looks, but for its loyalty…and the breed is gaining more fans every day! History - The breed has been around so long, its exact time and place of origin is unknown. It’s been called, “the Ancient Dog of Malta,” “the Roman Ladies’ Dog,” and “the Maltese Lion Dog.” Thought to be a descendent of a Spitz-type dog, the earliest known record of the Maltese we know today was found on a Greek urn, dating back to 500 B.C. But it wasn’t until the first century A.D. that the dog was actually attributed as being from the island of Malta in the Mediterranean. Over the following centuries, the Maltese happily rested in the laps, and trotted at the sides, of many a Greek and Roman noble man (and woman). Poets and philosophers even spoke of the dog’s beauty and many virtues, and it is said that the breed made it all the way to England with Crusaders who were returning home from the Mediterranean. But in the 17th century, certain breeders decided that the Maltese needed to be made smaller (it was already a very comfortably-sized lap dog, so the motivation behind this is largely unknown). And thus, the cross-breeding began. The Maltese was bred and bred, until finally, a writer in 1792 reported that it was barely bigger than a squirrel! In a mad rush to save the species, the Maltese was bred with other small dogs such as Poodles, Spaniels, and Bichons. 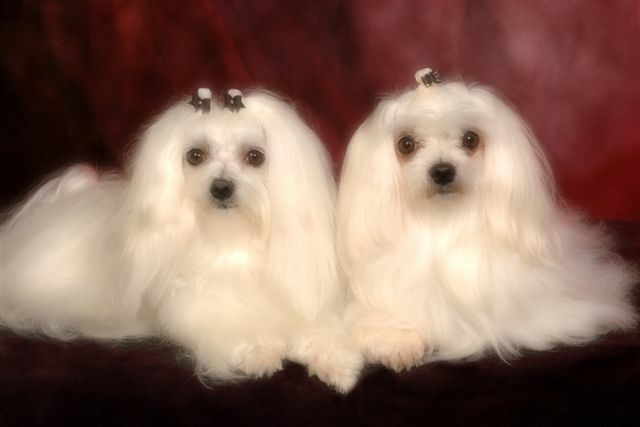 Unfortunately, that breeding resulted in another problem: in the early 1800s, there were at least 6 different breeds of Maltese! As the breeding bonanza subsided, and the Maltese finally became the dog most of us know in the late 1800s. “The Maltese Lion Dog” made its first appearance at the Westminster in 1877, to rave reviews. And in 1888, the Maltese was registered into the AKC. As years went on, the Maltese gained in popularity by leaps and bounds, and today, it is beloved the world over. This determined little dog has endured for 25 centuries…so many dog lovers can’t be wrong! Breed Standards - In terms of breed standards, the average height of males runs between 8 - 10 inches (21 - 25 cm), and 8 - 9 inches (20 - 23 cm) for females. Average weight of both ranges between 6½ - 9 pounds (3 - 4 kg). Acceptable coat colors for show dogs (and most dogs of the breed regardless) are white or light ivory. There may also be some shades of peach or lemon around ears and feet, but they are generally not accepted in the show ring. The coat itself is made of a single layer of silky hair, not fur. If intended for the show ring, the coat is kept long with a center part down the back, hanging flat over the sides of the body, ending close to the ground (about 8½ inches or 22 cm). 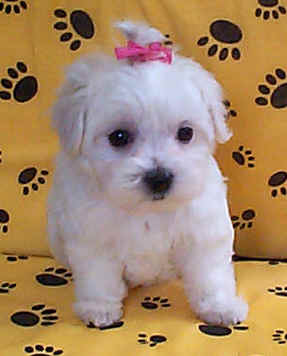 But for most owners, their Maltese sports a “puppy cut,” which is short, and easy to care for. The body is compact and fine-boned. The head is slightly rounded, with a tapered muzzle, and heavily-feathered low set ears. With a black nose and eyes that are black, round, and oh-so-imploring, there’s little doubt why the Maltese has been touted for it beauty for so long. For any other specifics on breed or breed standards, you can also contact your local Maltese breeder. Energy – The exercise needs of the breed can usually be met with a daily walk or a good play session. They do very well indoors, which is why they make such great pets for small spaces. The breed is very playful and happy, eager to please, eager to play…and this behavior and energy level remains fairly consistent as they grow older. 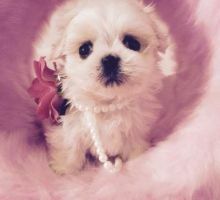 Though the exercise requirements are not overly demanding, if those needs are not met, the Maltese can suffer from “Small Dog Syndrome,” which can manifest in behavioral problems, barking, and separation anxiety. Temperament – The breed is fearless, loveable, friendly, sociable, spirited, and playful. This highly intelligent dog is quick to learn tricks, but needs a firm and consistent pack leader. They are devoted little pups, very alert, and quick to sound a barking alarm. This barking, though, has become a problem for the Maltese in many parts of Australia. Research done in conjunction with the RSPCA found that this barking led many owners to abandon their Maltese dogs, making this dog the “most dumped” breed in the country. While the Maltese is not necessarily prone to excessive barking, this trait is more likely a behavior brought on by being overly-spoiled, or owners who have not asserted themselves as pack leader. 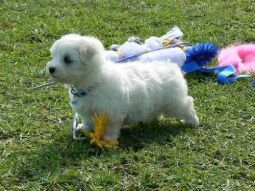 By and large, though, the Maltese is a playful, loving, loyal companion dog that readily makes friends with other pets. They may be slightly wary of strangers, but will warm quickly once introductions are made. The breed has endured for so long and has garnered so many fans, through sheer personality, intelligence, and looks…and they remain a dog of frisky refinement and spirited grace. Health – Happily, Maltese have a relatively long life span of 15-18 years, but there are some genetic conditions to look out for in the breed: patellar luxation (kneecap dislocation), open fontanel, hypoglycemia, hydrocephalus, distichiasis, deafness, deafness, white shaker-dog syndrome (slight seizures and shaking suffered by many white dogs, the cause of which is unknown, but can be treated successfully with medication), and tooth decay. The problems with kneecaps, tooth decay, and deafness tend to increase as the dog gets older. Also, as with many small dog breeds, some Maltese may have sensitive digestive systems. They are inclined to to sunburn along the hair parting (if kept in a long cut). Most importantly, though, they are very susceptible to damp. Keep them as dry and warm as possible (but don’t expose to excessive hot weather either). Grooming – The good news is that the breed sheds very little, which is great for allergy sufferers. But the bad news is you will otherwise have to invest some time in grooming your Maltese. Since the coat is hair, not fur, it will need to be combed (very gently) every day or two. If kept long, the coat can be “wrapped” for protection and the hair on top can be tied in a topknot, but most owners prefer to keep the short “puppy cut.” And obviously, the white coat may be difficult to keep clean in some areas…especially around the eyes (tearing or staining is common), and the mouth after eating. It is preferable to bathe or use dry shampoo regularly, and get your pup dry and warm as quickly as possible afterward. After bathing, swab the outer ear canal with a cotton ball soaked in mild astringent, but also be sure to have the eyes and ears checked regularly. Your local Maltese breeder can provide even more guidelines, tips, and tricks in caring for your beloved Beagle. Negatives – The Maltese has some definite grooming requirements (even if the coat is kept short). They also require some firm but gentle training to prevent behavioral problems. And, though they are fairly long-lived, there may be some genetic conditions to keep an eye out for. Positives – There must be some serious merit to this little breed for them to have persevered for so many centuries. Fans of the breed will tout the Maltese as the ultimate and ideal small companion dog…affectionate, happy, intelligent, loyal, sociable, alert, and of course, beautiful to behold. If you don’t mind devoting some time to keeping your dog looking (and acting) its best, the affable Maltese could be the dog for you!